In the fall of 2000 I did a research paper for school on the Palette of Narmer. We were supposed to chose an example of ancient art and compile a report of what the art critics were saying about it, then explain whether or not we agreed with them and why. After a couple weeks of hunting through Janson's History of Art and similar books, this is what I had. The Palette of Narmer, a stone cosmetics palette dating back from the first Egyptian dynasty, c. 2925 B.C., is flat and two-sided, the pictures carved in low relief from a piece of grayish-white slate. The palette is 63.5 cm high and tapered in shape from a wide top to a narrow bottom. Each side is divided into pictorial strips with two-dimensional figures of animals and people. Prominent on the front is a picture of King Narmer standing over a defeated enemy, beneath which are two more people that appear to be running. On the back, two slaves guide two strange animals with intertwined necks beneath rows of figures that might represent the scene of a battle. At the bottom on the back is another strange beast. The most important figures are always larger than less important figures. There is no background in any of the pictures. 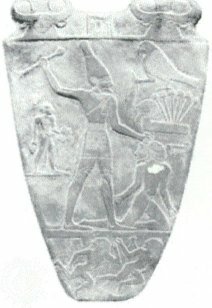 Experts in art often focus on the design and style of the Narmer Palette. Apparently the Palette represents a breakthrough in ancient art. H.W. Janson tells us that "not only is it the earliest surviving image of a historic personage identified by name, but its character is clearly no longer primitive..." (Janson's History of Art). This is easy for anyone to see; there's a big difference, especially in the layout of the figures and details on the palette, between the palette and earlier works of art, like cave paintings. As René Huyghe said, the palette shows us that "…artists were already producing works consciously designed within a framework and dividing the surface by means of verticals, horizontals and symmetrical axes" (Larousse Encyclopedia of Prehistoric and Ancient Art). It is these axes that allow the observer to see and understand the events it shows. Without them, the figures would be so close together that one scene would be inseparable from the next. Hieroglyphics act as labels for each of the scenes, allowing the observer to further understand events; this is presumably how Narmer was identified. Altogether, the palette marks "a style that was to persist over the long course of Egyptian art" ("Egyptian Art," Encyclopedia Britannica). While I agree with the quotes that claim the Egyptain style is new and unique, what most impresses me about the Palette of Narmer is the detail of the carvings. Tiny lines and designs are carved even into the smallest of figures, and everything is perfectly symmetrical. It is hard to imagine that this palette was done by hand, especially when one considers the tools available at the time. The unknown workman had a great deal of skill and experience. It is any wonder Egyptian art is so famous today? "Egyptian Art." Encyclopedia Britannica. Chicago: Encyclopedia Britannica, Inc. 1991. Huyghe, René, ed. Larousse Encyclopedia of Prehistoric and Ancient Art. London: Paul Hamlyn, Ltd. 1962. Janson, H. W. History of Art. New York: Harry N. Adams, Inc. 1997.